The key to great, flavorful gơi bắp cải gà (chicken and cabbage salad in Vietnamese) is to boil the chicken properly. Flavoring the broth prior to boiling the chicken is essential. This is the one chance you have to infuse additional flavor in the meat. As Tatie Danielle (aunt) says, "everyone knows how to make the sauce, not everyone knows how to cook the meat properly." She used to run a restaurant in the early '90s and is the best Vietnamese chef I know. Even though this is referred to as a salad, it is typically eaten as a main course. Not only is it a great, filling meal, but nothing goes to waste. 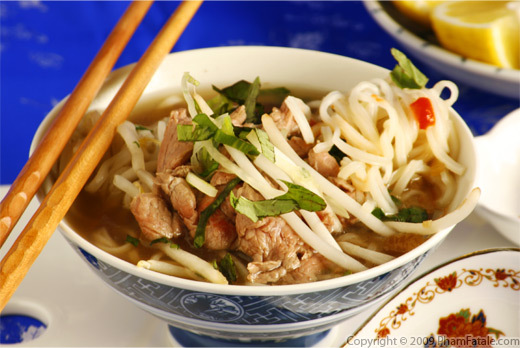 With the leftover broth, you can make súp bún măng gà, literally bamboo and chicken rice noodle soup, or a rice congee (cháo gà in Vietnamese), which is a type of chicken and rice porridge. The porridge in particular is great in the winter. I'll post the recipe when it starts getting really cold. For now, enjoy some Vietnamese Chicken Salad! Pickling the red onion: Peel and thinly slice the red onion; mince finely. Place the sliced onion in a bowl, sprinkle with brown sugar and drizzle with the juice of half of a lime. Toss well. Set aside. Making ginger paste: Clean the ginger. Peel the ginger root with a paring knife and finely chop it. Place the chopped ginger in a mini-blender, adding about 2 tablespoons (or more) of water for a smooth flow. Gather about 2 teaspoons. Set aside. Bring about 7 quarts of water to a boil. Add the fried onions. Boil for about 5 minutes. No sugar is necessary yet because of the natural sweetness of the onions. Do NOT salt. Add the whole chicken and chicken thighs and drumsticks to the onion broth. Cook for about 10-12 minutes. Remove the whole chickens from the pot. Let them cool a bit until you can handle them without discomfort. Make several deep diagonal incisions throughout the birds' flesh. Place the chicken pieces back in the broth. Add half a daikon, whole onion, rock sugar and mushroom seasoning salt. Bring to one more boil and simmer for another 30 minutes until the whole onion and daikon are soft and tender. Season with salt. Bring back to a boil, then immediately lower the heat to a gentle boil. Cook for another 10-12 minutes. Remove the chicken pieces. Let them cool a bit until you can handle them without discomfort. Shred the meat. Sprinkle with 1/4 teaspoon of black pepper. Set the meat aside on a platter. Reserve the chicken broth for another recipe (see tips). Peanuts: In a mortar and pestle, slightly crush the peanuts. You still want to have visible pieces of peanuts for a crunchy texture. Gỏi sauce (salad dressing): In a bowl, combine the rest of the lime juice, sugar, salt, pickled garlic, ginger paste and soy sauce. Mix well. Assembly time: In a large bowl, combine the shredded chicken, red Thai chili, shredded daikon, dried fried shallot. shredded cabbage and pickled red onion with its macerating liquid. When you're ready to serve, drizzle the gỏi sauce (salad dressing). Add all the chopped herbs. Toss well. Season with more salt (if needed) and the remaining black pepper. Sprinkle the peanuts (if you like). Serve with a little muối ớt (chili salt) and nước mắm (if needed) on the side. Call your gang immediately. For the vegetarian version, check out the banana flower salad recipe. If you want to make a very authentic soup, the choice of chicken is crucial. Buy it from your Asian market and ask for a gà đi bộ, literally a walking chicken. In Vietnam, gà đi bộ chickens are considered "free-range"; the chickens are "trained" to run and as a result the meat has a totally different texture from the chicken found in American grocery stores. Frying onions is easy. Chop the onion. Heat about 1 inch of canola oil in a skillet. Fry the onion in the oil, stirring frequently to prevent the onion from burning until the color is evenly golden brown. Drain the oil on paper towels. I always make extra so that I can vacuum-seal and store in the freezer for future use. I place about one cup per bag. You can store them up to 3 months. I think it's the best way to keep the same flavor without getting freezer burn. I keep them exactly the same way I would with extra pesto or (papaya) meat tenderizer for poultry. Did you know that the flatter the onion is, the sweeter it is? I always try to pick flatter-shaped yellow onions at the market. Mushroom seasoning salt brings a very distinct, earthy flavor to the sauce. You can find it at gourmet specialty stores or in most Korean markets. I get mine at Marina Foods -10122 Bandley Drive -Cupertino, CA 95014. Daikon (củ cải trắng in Vietnamese) is an Asian turnip that looks like a large white carrot. I use this root a lot for making broth for the natural sweetness it provides. Discard the root when the broth is ready. It's also delicious when it's pickled with carrots and is commonly used in Vietnamese bánh mì sandwiches. I love bean sprouts and fresh cabbage in salads; they add some crunchiness to the dish. Rau răm and ngò gai are Vietnamese coriander leaves used in South Asian cooking. I buy them at the Asian market. If you don't have any, just use regular cilantro and double the amount. To prevent the herbs from darkening, chop them at the very last minute, toss them into the salad and serve immediately. I use Ponzu brand soy sauce; it's perfect as a dipping sauce. It's lemony and less salty than regular soy sauce. 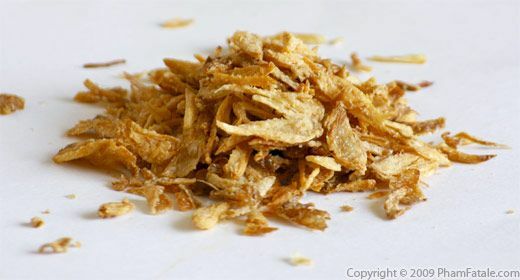 I buy dried fried shallots at the Asian store. It's crunchy and very strong in flavor. You can also make your own by frying thinly sliced shallots if you like. Make ginger lemongrass drink with the remaining ginger paste. If you don't have a mortar and pestle to slightly crush the peanuts, just use a rolling pin. Published By: Jacqueline Pham on October 25, 2009. That looks yummy! I can see why it would be a main course, as it has got so much good stuff in it. That's definitely my kind of salad! That's interesting you use soy sauce for the dressing instead of fish sauce. I've only seen this salad made using fish sauce in the past. I bet it tastes great as well! Very interesting how the meat is cooked in stages. Learned a lot reading this post, thank you! I love these sorts of salads, but what I really loved were all your wonderful hints and ideas not to waste the food. Very nice. Another on my list to try. Authentic goi ga is prepared with fish sauce (nuoc mam). We had non-Vietnamese guests, so I decided to serve it on the side in case someone found the fish sauce too strong. Here's a link if you're interested in making a nuoc mam based sauce.